Meat alternatives have been proposed as one solution to decrease meat consumption and thus its negative effects on individuals and the environment. Using three meat myths identified in literature on meat consumption—meat eating is normal, natural, and necessary—this chapter discusses how they emerge in six selected print adverts: (1) normal: dishes containing meat alternatives are portrayed as traditional, perpetuating normality; (2) natural: the myth that it is natural to eat meat is not explicitly opposed, but bypassed; (3) necessary: meat alternatives are portrayed as even more necessary for good health than meat. The author proposes changes to neutralise these meat myths; but they are unlikely to be adopted by advertising due to its commercial goals. Although meat alternatives are theoretically preferable over meat (and can help individual transitions to vegetarianism), their marketing perpetuates meat myths, and may therefore reinforce a meat-centred culture. Meat alternatives—sometimes also called meat substitutes, meat analogs, vegetarian meat, or similar (Sadler, 2004)—are meat-like food products. They are “something that looks, tastes, and feels like meat” (Zorpette, 2013, p. 64), that “should have a certain resemblance to meat in order to replace meat on the plate” (Hoek, Boekel, Voordouw, & Luning, 2011, p. 371). Other definitions propose meat alternatives to have “approximately the same taste, appearance, and texture of a related food made from meat, poultry, fish or shellfish … [while their] nutritional value is, in general, approximately equal to (or sometimes greater than) that of the related food, including essential vitamin B-12” (Shurtleff & Aoyagi, 2014, p. 5), or as “products that fulfil consumer demands of healthy and tasty products which both replace the function of meat in a dish and contribute a similar high protein nutritional value” (Wild et al., 2014, p. 45). All these various definitions describe food items which relate to meat in ways that consumers can observe; including sensory aspects and experiences, the function of meat in meals, as well as nutrition and health. Consumers were found to understand novel products as relating to established ones on the basis of ‘similarities’ and ‘analogies’; similarities are shared attributes, such as colour or texture, analogies are shared relations, such as goals or scripts (Michaut, 2004). 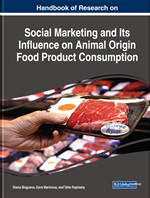 This chapter understands meat alternatives as commercial products which are portrayed as sharing attributes, such as physical properties, or their product name with meat, or sharing relations, such as their function for nutrition or in a meal. Meat Alternative: A manufactured food item which aims to be similar to meat by pointing out shared attributes and relations; a meat substitute, meat analogue, vegetarian meat, vegan meat. Substitute: A product which can replace another product as it has similar attributes or functions; an alternative or replacement. Myth of Naturalness: Justifies meat consumption because it has always been this way, religion says so, or because humans are meant to eat meat. Myth of Necessity: Justifies meat consumption because it is a main requirement for human health, an economic imperative, and needed to keep animals contained. Myth: A rigid and widely-held belief about a sensitive topic in society which is difficult to criticise and is hardly mutable. Textured Vegetable Protein (TVP): A fibrous, largely tasteless, meat-like product obtained from the extrusion of soya protein; TVP is a registered trademark by Archer Daniels Midland, but is often used in a more generic way. Myth of Normality: Justifies meat consumption because meat is available everywhere and part of everyday life, rituals, and traditions.